My experiences with the Paranormal!!! Well, the above topic is controversial and many would disregard. Some more would say, how can I encourage such topics when I am a man of science. Well, for the former it’s upto you to not believe me. I will not force you. For the latter, science does not teach me to disbelieve the paranormal. It teaches me to record all possbile observations and record them and finally analyze them. Whatsoever, I am merely mentioning my observations and the analysis. First encounter: It was a long time back. I was in class VI and very studious. Me and my parents used to live in Indore and that too in a newly built home. The incident I am about to mention is only one that happened in that home during our stay which is 7 years. The day it happened was not a special day. My school was off. I was studying on our dining table and my mother was working outside in the garden. The dining hall was connected to a washroom which had a tap that made a specific sound when opened. I used to concentrate hard on my studies back then. Suddenly, I heard that tap being opened. I didn’t pay any attention as I assumed my mother must have gone in. I felt strange when no one came out even after half an hour. So, I went to check and found the door open with no one inside. I was curious and went outside to ask my mother when did she get out. Her reply shocked me. She told me that she thought it was me in the bathroom. Yes, the tap made sound loud enough to be heard from outside. Second encounter: This incident happened when my family used to stay in Raipur. We had just returned from our trip to Sri Lanka. It was a Saturday and we had a dinner invitation that evening. My mother offered prayers to the god Shani(Saturn) every Saturday and same happened that evening. We were supposed to go directly to our host’s place when my father suggested that we take the laptop to show them photos from our trip. So, we went back home and I got inside to get the laptop. When I was getting out of my parents’ bedroom, I noticed a cat entering the guestroom. It was not unnatural since a lot of cats did that in our home. I went to take it out but couldn’t find it anywhere in the room. I assumed that I must have seen wrong and went out, locked the door and left for the dinner. When we came back, the house seemed to be ransacked. The whole volume of encyclopedias were dropped from their original place, magazines in my parents’ bedroom were strewn about. I thought maybe it’s the cat that entered did it but again no sign of its existence could be found. Weirdest part, there was a bouquet of flowers kept adjacent to the encyclopedia which was untouched. Furthermore, none of the windows were open when we got back which meant whatever was inside did not try to get out. Nothing of such sort happened again. Third encounter: It is the strangest. This happened in my hostel room during my stay at IIT Kharagpur. 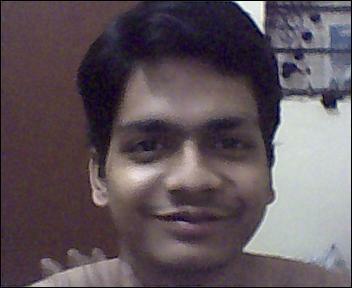 I had a habit of taking my own pics using my webcam in my room. I didn’t always try to check the photos. I stayed in that room for only one year and shifted to the adjacent room the next year. That year I was sharing my self photos with my girlfriend when I came across the following photograph. By the way, I don’t edit photographs and I don’t know how to use Photoshop. I hope the reader can notice the faint image of a hand on my shoulder. Well, it is not mine. The thumb can be noticed near my neck. I didn’t feel anything when taking the picture. I have also attached a photo of my left hand for comparison. I have felt a certain presence from time to time and my friend who used to stay in that room has witnessed certain incidents too. He used to complain in a regular basis that there was knocking on his bed when he was sleeping. I didn’t understand when one night in August it happened to me too. I had just dozed off when there was a sharp sound of a kick on my bed. I sat up, shocked and there was no one to be seen in my room, the door was tightly shut from inside. Another incident happened during February early morning. I was woken up by the fluttering of a curtain fixed on my window. All the windows were shut since it was cold outside so there was no chance of any wind that could flutter the curtain. I suggested whoever was doing it to stop fluttering and let me sleep. The movement stopped immediately. The last and the most recent incident, the entity stole two matchboxes from my table drawer. I distinctly remember keeping them there before I left for Kolkata on a Saturday morning. When I came back on Monday, they were gone. I searched the room frantically and didn’t find even a trace. My observations have been made under no influence of drugs or alcohol. My analysis? There are spirits but they don’t exactly affect in the way shown in movies. I have not been able to contact the one in my room. I really don’t know how else to place these observations. The image with the hand is really creepy and it is very vivid too. It freaked me out the first time I noticed it. Freaked out is just an understatement !! Do u experience simillar things now too ? I haven’t encountered anything similar until a few days back. Someone was moving my towel every now and then and the reason was unclear. One morning I got up to see everyone sleeping and my towel moved, again. I shifted it to its original position and went to the common bathroom. I went back to my room to get the razor and one guy had woken up and was in the bathroom. I went, shaved and came back. I noticed my towel moved. The guy was still in the bathroom and others were asleep. Even if someone wanted to irritate me, why would he get up just to irritate me?